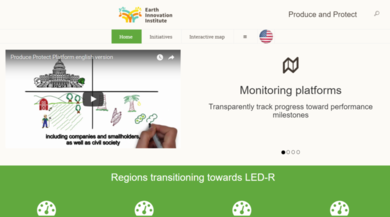 This interactive map is a component of the GCFimpact and Produce Protect Platform to facilitate tracking the performance of key jurisdictions that are on their path to a sustainable rural development. We aggregate credible data to create a spatio temporal application to monitor and report on the jurisdictional progress towards territorial sustainability goals. Efficient monitoring at the territorial scale can strengthen multi-sector commitments to achieve deforestation goals and facilitate the delivery of incentives to the rural economy actors that need to make the transition to low-emission, low-deforestation production systems. Use the available layers or define specific search criteria to identify municipalities performing according to your definition. Click on any state or municipality to see the production and forestry indicators on the right panel. For a detailed explanation of the platform visit our youtube channel. Descripción: State and municipal administrative limits of Mexico. Simplified geometry to allow rapid visualization on the Web. Descripción: Forest land area reported by CONAFOR in 2015 based on the Land use Land Cover INEGI Maps series 1-5. This indicator considers the definition of forest lands adopted by Mexico for the FREL and IRE, which includes forests, shrub and herbaceous vegetation. Descripción: Deforestation reported by CONAFOR in 2015 based on the Land use Land Cover INEGI Maps series 1-5. The definition of deforestation adopted by Mexico for the FREL and IRE is used, which includes forests, shrub and herbaceous vegetation. Deforestation is obtained by evaluating the loss of forest land between maps and a subsequent statistical adjustment of the data. Descripción: Indice de desarrollo humano estados (2012). Este índice incluye componentes de bienestar: esperanza de vida, años de educación promedio y PIB per cápita. El índice no está disponible para municipios. Source: Programa de las Naciones Unidas para el Desarrollo, México. Time period: 2012 for states and 2010 for municipalities. Source: INEGI and CONAFOR, Mexico. Descripción: Total de emisiones de CO2 acumuladas por deforestación para el período 1990-2015. Esto incluye las emisiones de los depósitos de carbono considerados por el FREL: biomasa aérea. Método: Se calcularon las emisiones de la deforestación como la deforestación anual derivada de mapas de cobertura terrestre INEGI multiplicado por el carbono medio por hectárea derivado del mapa de carbono publicado por Cartus et al. El carbono se convirtió en peso de CO2 usando un factor de 44/12. Source: Procesamiento Earth Innovation Institute con base en datos Conafor y mapa de carbono Cartus el al.